Ahhhh, I love creating with wood! It puts me in a happy place. 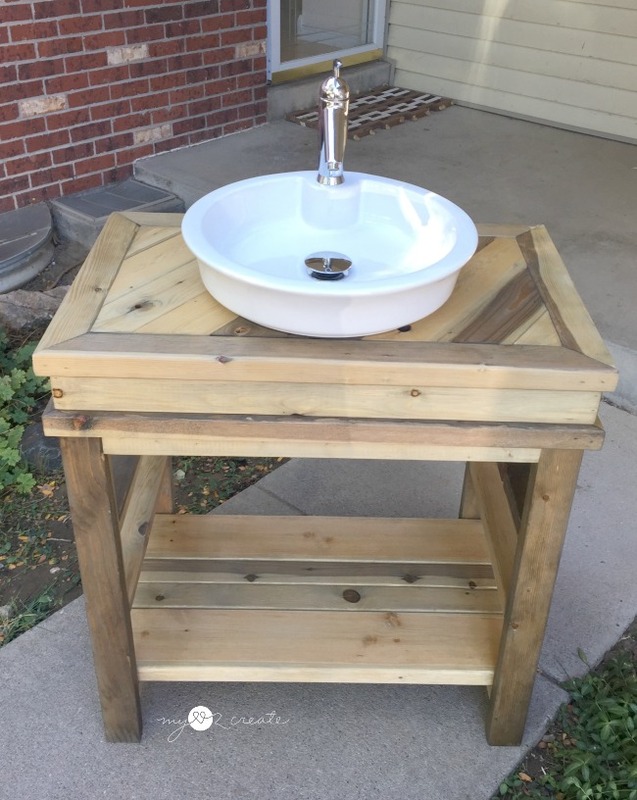 I designed this vanity with small powder rooms or guest bathrooms in mind, so it is a simple build, yet full of character and charm! This is what I started with, minus a scrap piece of mdf/plywood that is not pictured. 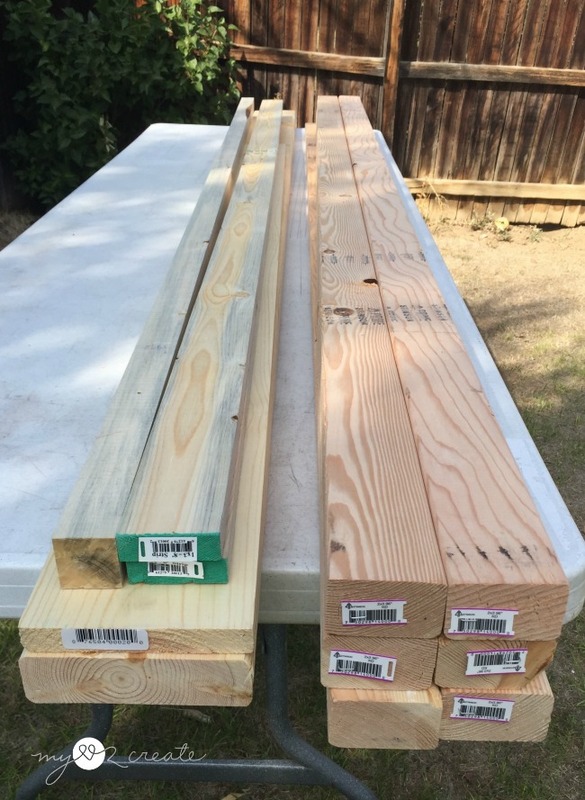 The cost of lumber for me (not counting the scrap plywood) was under $35. That is a smoking deal! I started out by building two-2x3 frames. 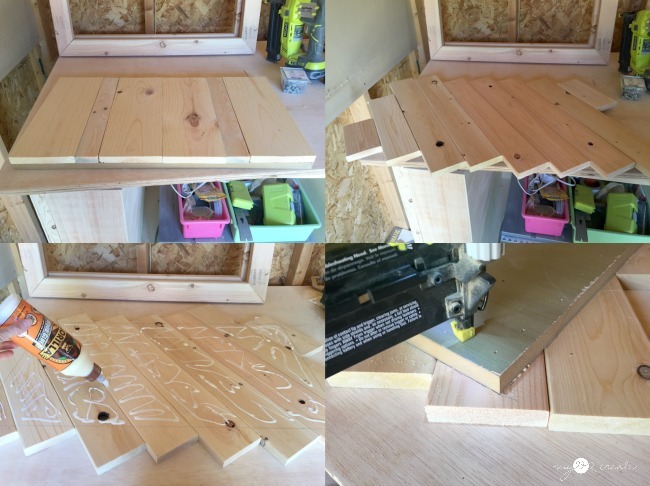 I cut the ends at 45 degrees and used my Kreg K5 Pocket-Hole Jig to drill pocket holes into each side of the short boards of the frame. 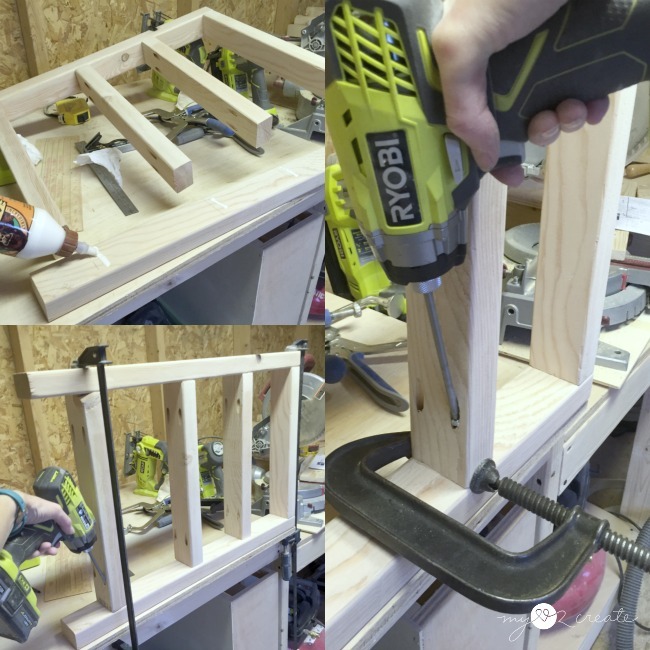 I made sure to adjust my Kreg jig for the 1 1/2'' thick wood, setting it at 2 1/2''. 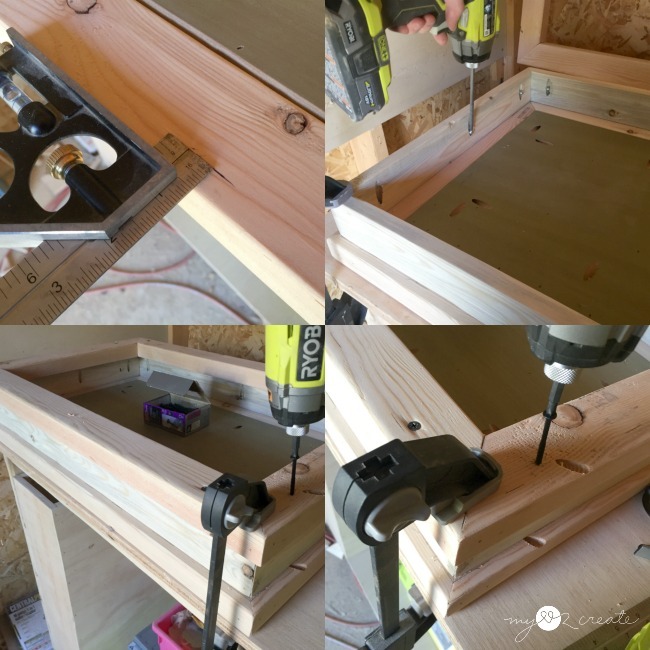 Then I glued the ends and used my awesome Kreg Automaxx Clamps to hold my frame in place while I nailed some 2'' finish nails into the sides and screwed in my 2 1/2'' pocket hole screws. For the top I also built a 1x3 frame. This time I used 45 degree bevel cuts (where you tilt the miter saw blade on it's side). 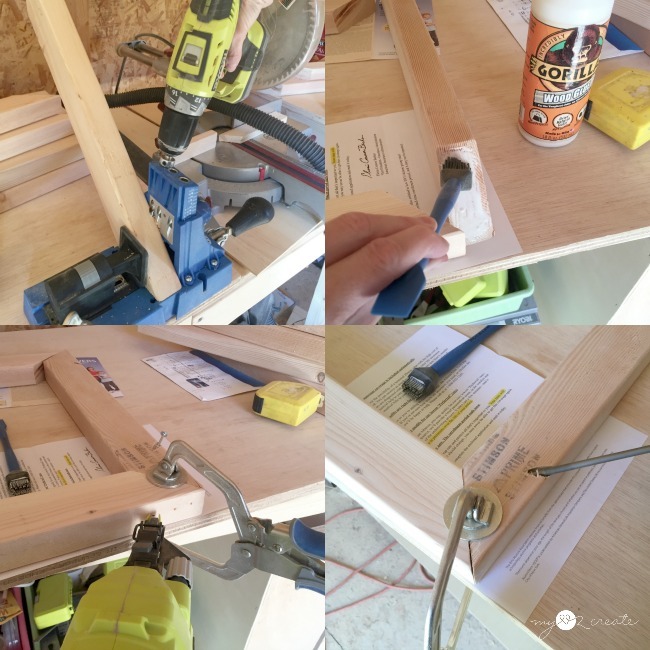 Then I glued, clamped, and nailed the frame together. I forgot to drill 3/4'' pocket holes into the boards before I built the frame, so I had do do it afterwards. They are for attaching this frame to the 2x3 frame. So learn from my mistake and drill your pocket holes before you build, it just makes it easier! I set them at a diagonal and glued on my cut plywood piece, then I nailed through the back of the plywood into the 1x4 boards to secure them. 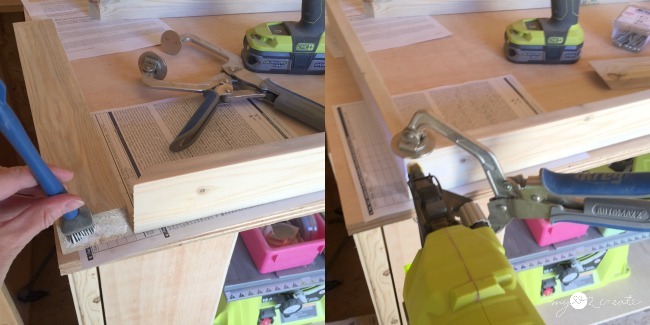 I marked where to cut by using my 2x3 top frame as guide. Then used my Ryobi Jig Saw to follow the cut lines. 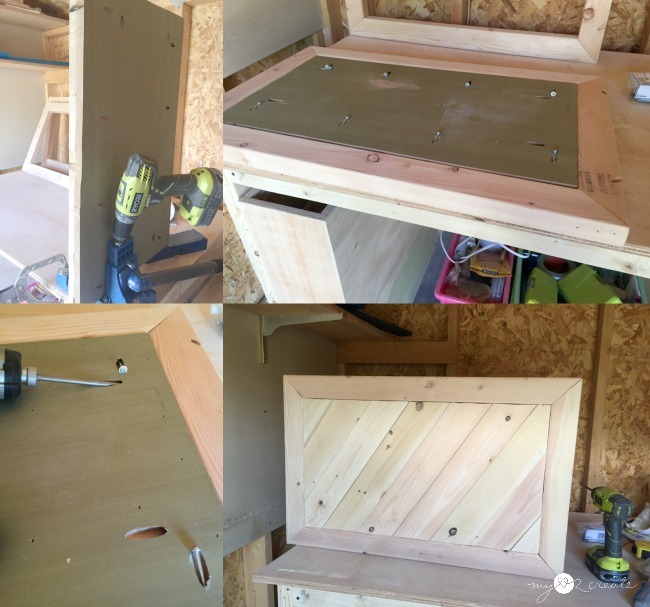 I proceeded to drill 2 1/2'' pocket holes into the back, and attached them with 2 1/2'' screws into the frame! Ta-da! My spontaneous moment for the day, and it was perfect. When your wood speaks to you...listen. Next, I was ready to build the top. I marked on the 2x3 frames 1/2'' inset on all four sides, for easy placement of the 1x3 frame. 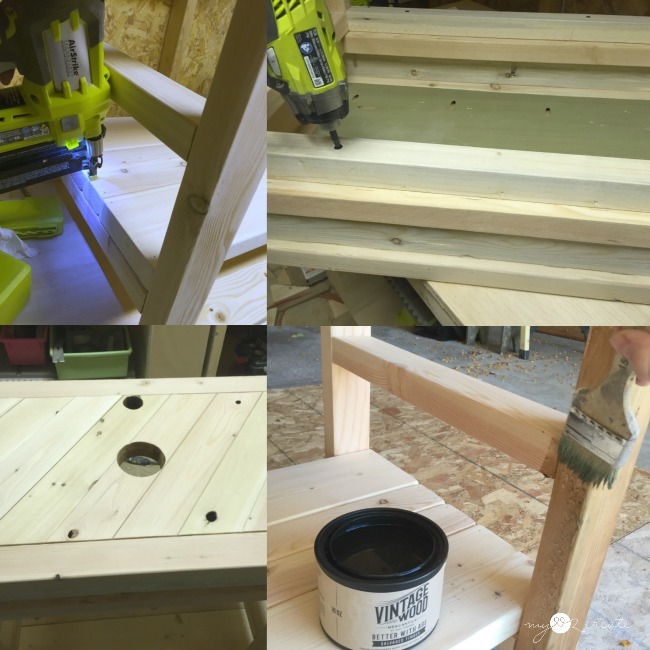 Then with the top flipped upside down, drilled on my 1x3 frame with my 1 1/4'' pocket hole screws (top photos). Then I added my bottom 2x3 frame, this time pre drilling and screwing in 3'' screws through the 2x3 frame into the 1x3 frame. Now to build the base, which you could build first, it doesn't matter. 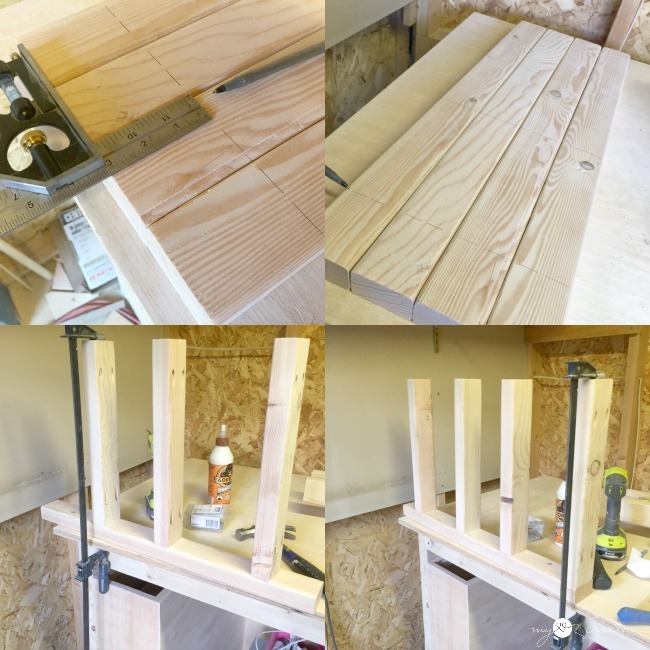 I used my combination square to mark all the legs for where my rails needed to be placed. Then I used wood glue to attach them with my pocket hole screws. I found it easier to use bar clamps to secure my boards. After I attached all the rails to one leg I then added them to the other leg. I used a C clamp to hold my middle boards in the right place while screwing in the pocket hole screws, and it worked great! The top rails were attached to the legs,and I used my handy Kreg Right Angle Clamps to hold them in place. 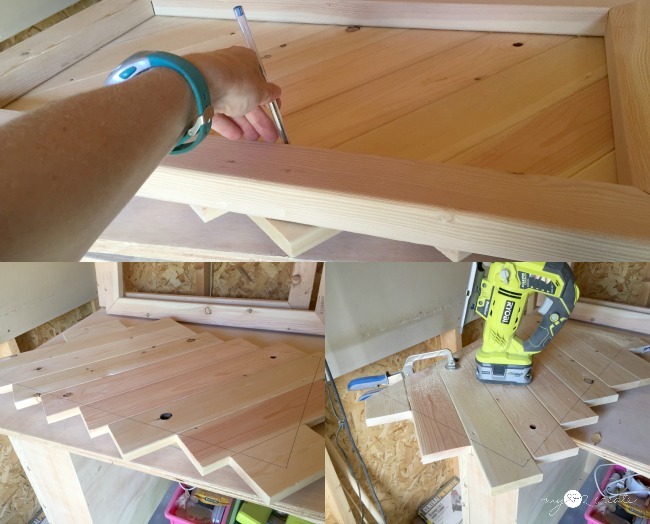 In the top left photo I am nailing on the bottom shelf boards with 2'' finish nails. Then I flipped over the top and placed the base on it and attached them with 3'' screws (top right). The results were so naturally pretty. I sealed it with 4 coats of Helmsman Spar Urethane Satin , sanding between coats with fine grit sandpaper. It is a good finish for protecting against moisture and temperature changes...aka-the bathroom. This type of stain will affect different pieces of wood in different ways which gives color variation in one quick easy step! With life crazy like it is, I didn't have a chance to actually install it in the bathroom, so I staged it by my front door. Nice. 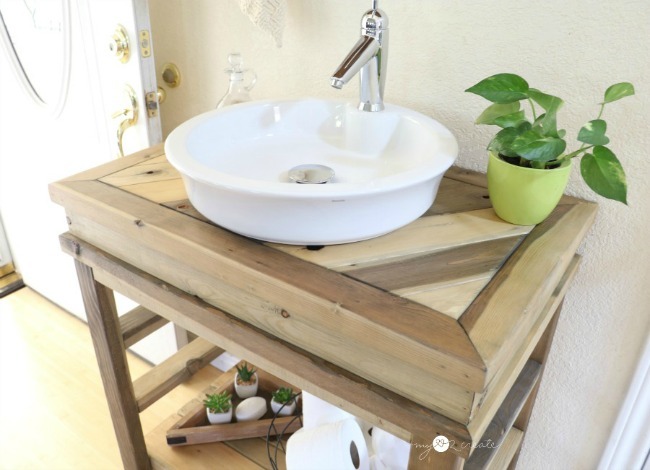 And how fun is this sink?! 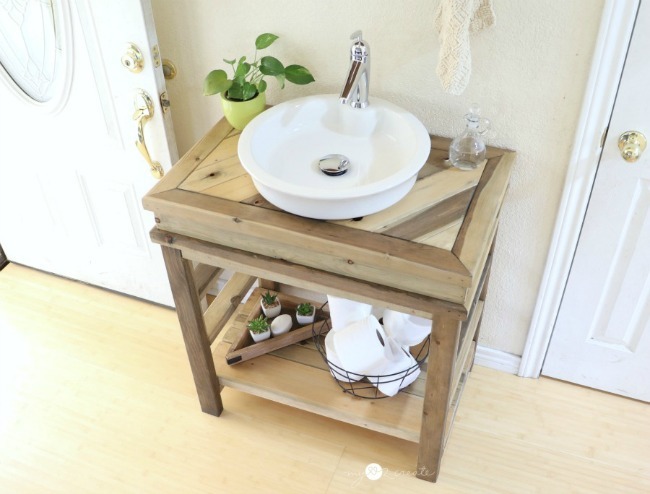 I actually got it off of craig's list (surprise surprise) for super cheap and had to remove it from it's old vanity, and trust me, it looks soooo much better on it's new home. 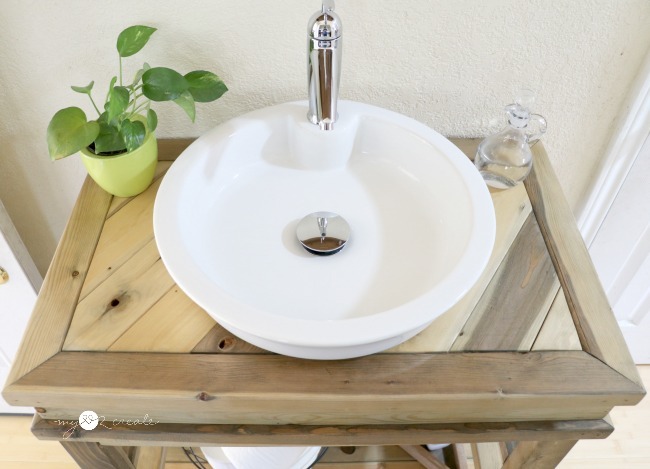 I really love the shape of the bowl, and how it is not tapered like a lot of other vessel sinks. 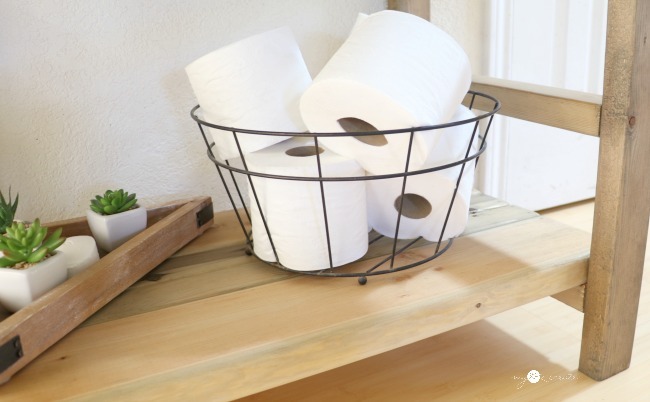 The open shelf on the bottom is perfect for simple bathroom storage and home decor. Now, to just get it in the bathroom...that is the hard part! Ha ha! Too much work to be done! So do you want to build your own?! 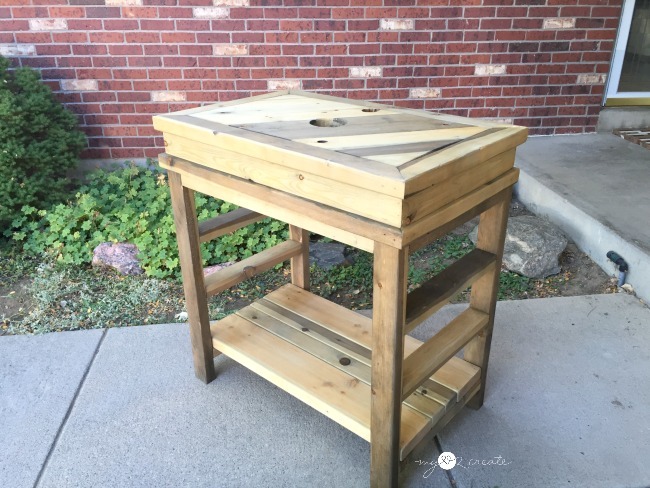 I am sure you remember some of my plans I have shared at Build Something, which is a new site by Kreg. 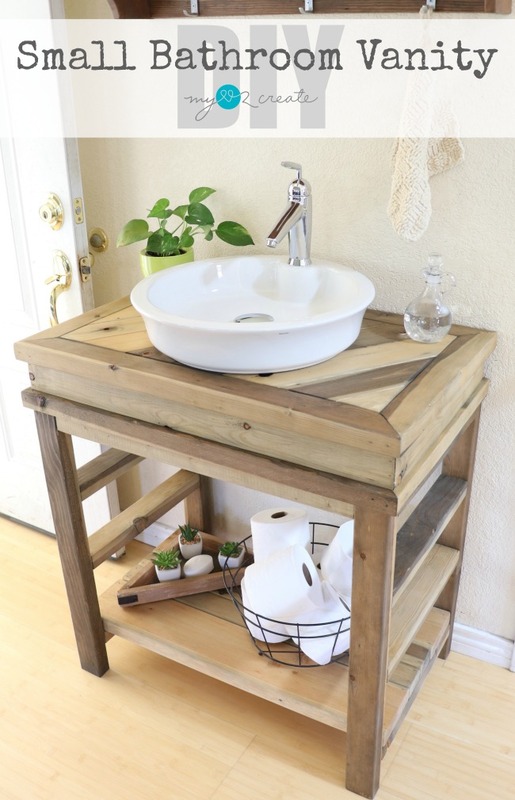 I have shared my Hanging Storage Shelf, X Arbor with Bench, and Reclaimed Wood Coffee Table. 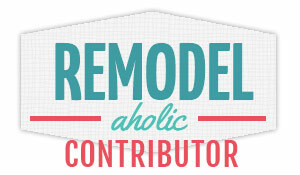 It is a great place to be a part of a building community and find amazing free plans! Remember if you are on Facebook, Instagram, or Twitter and you have been inspired by one of my projects, please share a photo and tag #MyLove2Create, I would love to see what you are doing and share it with everyone!! Love this and what a great tutorial! Thanks for linking up at the Talk of the Town! PINNING!! That turned out gorgeous! The Wednesday "To Grandma's House We Go" link party just started over at grandmashousediy.com and I thought you might be interested in joining it, thanks! It looks amazing, you did such an amazing job! Love it! You are always so clever! I love the things you create. This is fabulous!! Thanks for sharing it wit SYC. Pinned! This is gorgeous! Thanks for sharing this. 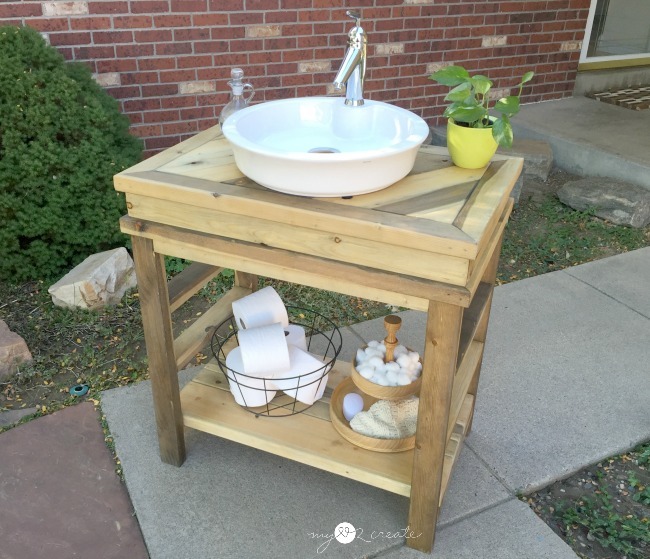 I need a new vanity in my small bathroom, this could be it! Hi Mindi! Theresa from Shoestring Elegance and the What to do Weekends Party. 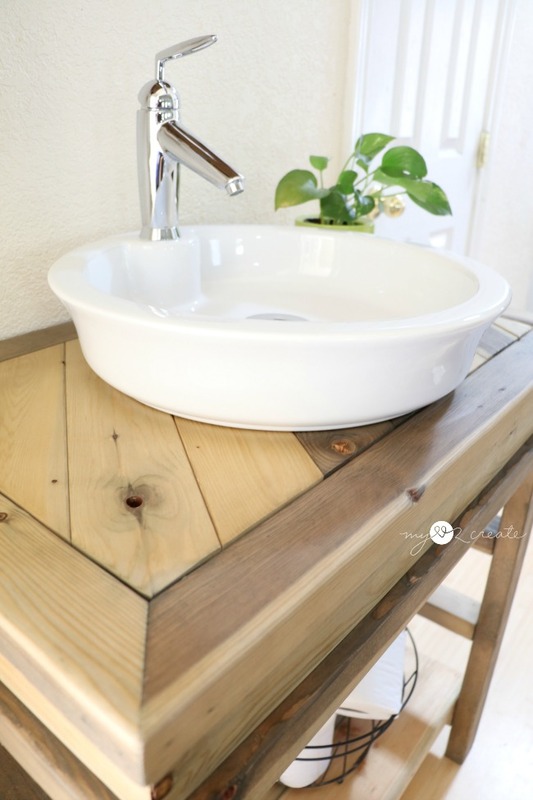 Just popping by to let you know I am Featuring your wonderful Bathroom vanity at this week's Party! Amazing! 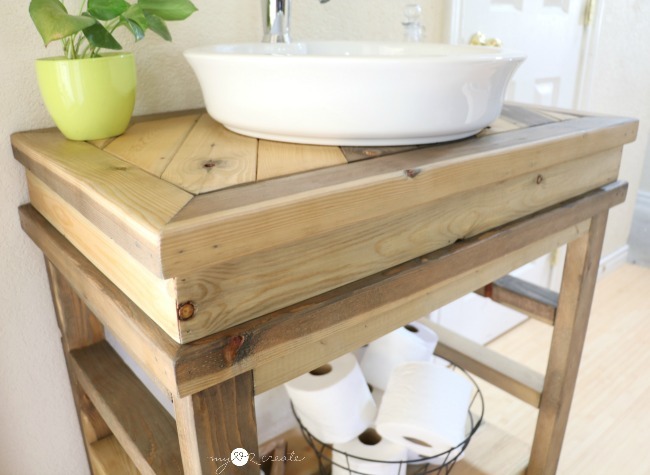 I need a new vanity in our tiny powder room, and it would be so much easier to build my own rather than shop for a vanity that fits the space. You've inspired me to start planning the design! wow! 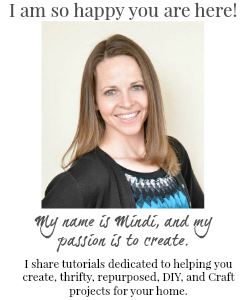 Mindi! 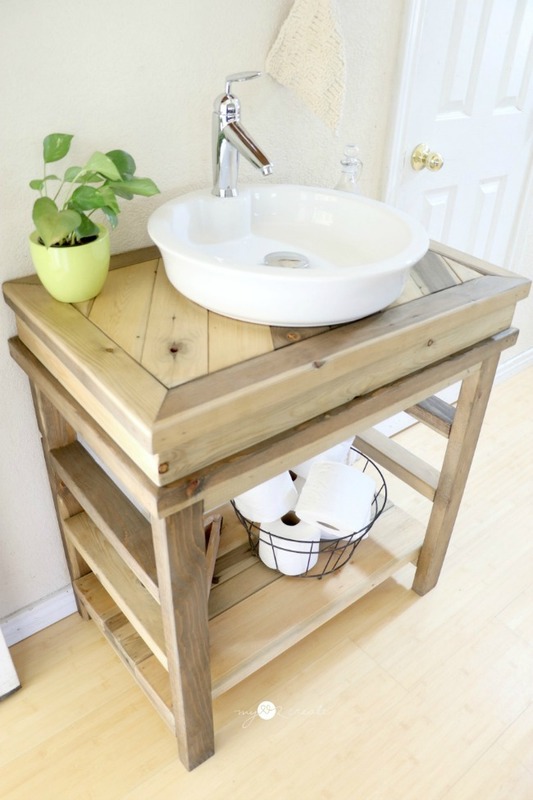 That small bathroom vanity is gorgeous!